IN WINTERTIME, EXPERIENCE ITALY AT ITS MOST SERENE! For 1st class rail travel throughout, including Single sleeper compartment on the overnight train journeys, £t.b.a. All prices are based upon RoE of €1.15 = £1 and are subject to availability, and will be confirmed at time of booking, as will exact train times. Discount fares are available to/from London St. Pancras International from most major UK rail stations, in conjunction with this tour – prices on request. 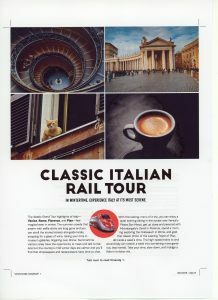 Hotel note: The hotels chosen for this tour – Venice: Hesperia or Continental; Rome, Amalfi; Florence Corona d’Italia – were selected for their quality, and proximity to the railway stations. In the event that any of the above hotels are not available, alternate hotels with similar features and location will be offered. The classic Grand Tour highlights of Italy – Venice, Rome, Florence and Pisa – feel magical even in Winter. The summer crowds that swarm with selfie-sticks are long gone, and you can stroll the storied streets alongside the locals, stopping for a glass of wine, taking your time in museum galleries, lingering over dinner. Summertime visitors rarely have the time to meet and talk to Italians but the country’s mild winter days are calmer and you’ll find that shopkeepers and restaurateurs have time to chat. 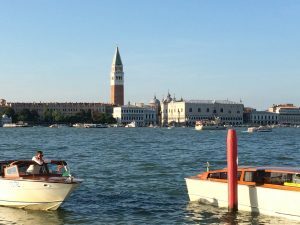 With this tasting-menu of a trip, you can enjoy a quiet evening taking in the sunset over Venice’s Piazza San Marco, get up close and personal with Michaelangelo’s David in Florence, spend a morning exploring the Colosseum in Rome, and grab that classic photo of the Leaning Tower of Pisa, all inside a week’s time. The high-speed trains to and around Italy can stretch a week into something more generous, less harried. Take your time, slow down and indulge a little in la dolce vita. overnight train (your choice of couchette or sleeping car as noted above) to Venice. checking in at the Continental or Hesperia Hotel, for 2 nights’ stay with breakfast. afternoon and evening in Italy’s capital. Day 5 Free day in Rome. to board the overnight train departing 23:05 (couchette or sleeper accommodation) to Paris. Day 8 Arrive in Paris 09:55. Spend the morning exploring before boarding an afternoon or evening Eurostar back to London St. Pancras.